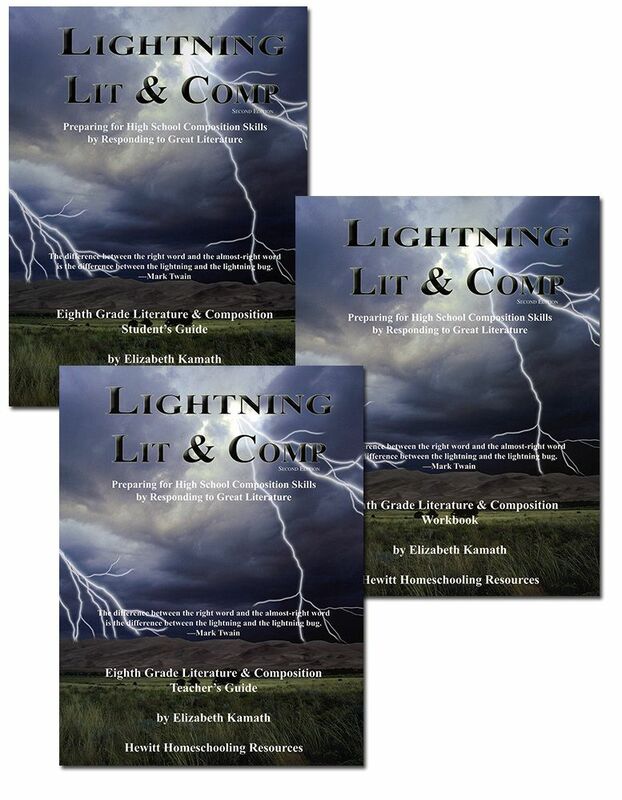 As part of the Schoolhouse Review Crew, I received the Hewitt Homeschooling Lightning Literature and Composition for Grade 8 to review. Just as you don’t want your students to settle for mediocrity, we don’t settle for mediocrity in our products or services. We believe students achieve excellence through a combination of enthusiasm, hard work, and superior resources. Create enthusiastic students by praising and encouraging them to do their best even at a young age. Develop thorough workers by requiring them to rewrite and redo when necessary. Don’t look for perfection, but don’t let them slide by, either. Finally, look to our products and services to help you along this path. A lifelong whole-hearted learner will be your result. 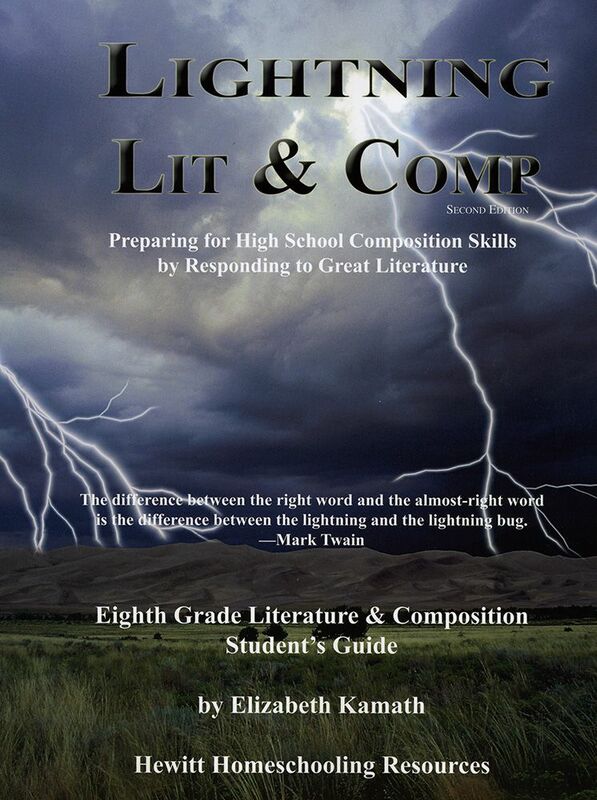 Hewitt’s Lightning Lit guides use full-length novels, autobiographies, plays, essays, short stories, and poems to teach deep reading and composition skills. Unlike some literature programs that take a scatter-shot approach (where none of the literature seems connected) or that try to include too much into one book, Lightning Literature guides focus on a few classics in depth, in a systematic manner. Lightning Lit & Comp is a year-long course consisting of a student guide, a student workbook, and a teacher guide. These are guides and lesson plans for the books. The actual books aren’t included. You probably already have some of them on your shelves. The majority of the books needed should be available at your library. I also found several available online for free. I used this curriculum with my 13 year old daughter who is starting 8th grade. I chose for her to do the A Christmas Carol chapter first. The lesson plans allotted 3 weeks for this book. Working at a steady pace, she used the full 3 weeks to complete it. The Student Guide, 269 pages, includes biographies of the authors, vocabulary, comprehension questions, lessons on the readings, additional lessons on composition, and writing exercises. I liked that my daughter could work on her own with the student guide. I used the teachers guide for the lesson plans and told her what pages to do, but she worked through the book herself. The Student Workbook is consumable. The workbook does not come with copy priveledges, so you will need a workbook for each student. 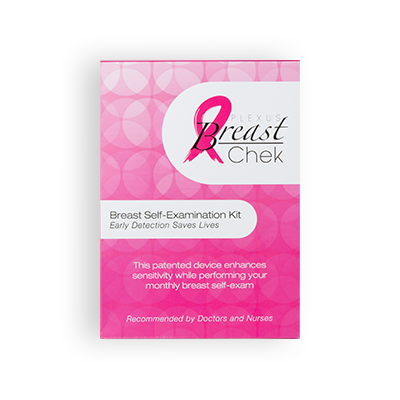 The workbook is 277 pages long with an average of 20 pages per book section. The pages in the workbook are also worked by the student alone. I checked her work with the teachers guide, and read some of her writings. She doesn’t like to share all of her writings, and I’m okay with that. The Teacher Guide includes a teaching schedule, answers to the questions and the workbook pages. Also included are extra teaching helps for the lessons, help in choosing appropriate writing exercises, and discussion questions. I really liked that at the beginning of each chapter, it tells you what the corresponding pages in the Student Guide and the Workbook are. This was our first time using anything by Hewitt Homeschooling. I really like how thorough this course is. We are going to be continuing with Lightning Lit & Comp for the rest of my daughters 8th grade year. The Teacher Guide sells for $20. Here are a few samples: Table of Contents, Weekly Planning Schedule, Sample Chapter. The Student Workbook, which sells for $25. You can view a the Table of Contents, as well as a Sample Chapter. The Student’s Guide sells for $25. You can view the Table of Contents, and a Sample Chapter. You can also purchase all three books in a bundle for $125 that contain all the literature books needed for the course.